Rylacia is one of the main populated chunks of a vast continent. For the most part, the continent remains unexplored by Rylacians, but some areas to the north and the south of this map have been populated. Brucia extends nearly a hundred miles south of the visible landmass. A remnant of an old Vieran military still survives north of the map as well, in the dragon lands, which lie beyond a thick mountain range. You can read about the remnant when you visit the tales of the Knights of the Moon. There are also tribes there, who have been there for many generations and are not of Rylacian blood. Off the east coast lies a stretch of sea that holds the Isle of Sentinence. Some say the place is cursed; others say it is overflowing with riches. No-one doubts that it is a dangerous place, where the hills overflow with lurkers that unfailingly return to the southern section of the island at night, to an unknown source of darkness. The northern, populated half of the island was once under Brucian rule, but is now its own kingdom. Beyond the island lies a vast ocean. To the west lie sharaglin lands. The Falamornian nobility once talked of expanding the borders of Falamorna after the first sharaglin wars, but the rocky jungle is treacherous, and not all the sharaglin were wiped out. The sharaglin since reformed their tribes and attacked Rylacia, initiating another savage war that was also shadowed by the threat of dragons. King Imalion waged a brief war against the sharaglin and hounded them back to their lands, but called an end to the war and did not allow his army to enter the sharaglin domain. The river that runs from the north-west corner of Lao-Umbarna, down through Falamorna, then right across Carapacia into the south, is called the “Lamen’lo”. Ths river gained part of this name during the year before the Sharaglin Wars, when corpses of farmers and villagers were found in the river’s flowing embrace. It was called “River Lament” until the sharaglin sent another heart-clenching tide downstream at the start of the first war. One of those who witnessed it called it “the dark tide”, which later became “the dark flow”. 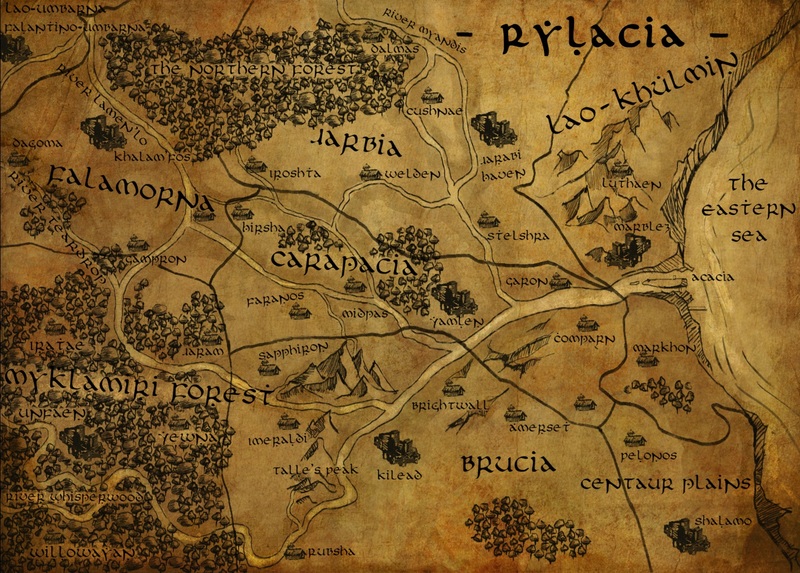 The chronicler of Falamorna wrote “Lamenting Flow” on the map for his record of the Sharaglin Wars, and since then the title stuck. It was formally modified to “Lamen’lo”, but the meaning remains the same.